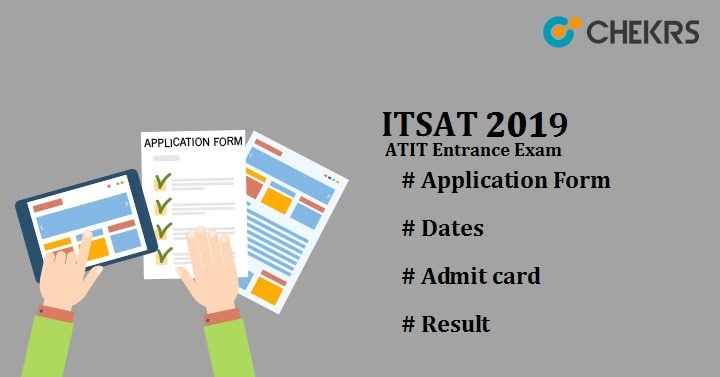 ITSAT 2019: The ATIT stands for the All India Admission Test in ICFAI Tech School and it is also known as ITSAT. ATIT Exam is compulsory to be given by all those students who want their admission in any of the campuses of ICFAI University. The ICFAI Tech School is part of the ICFAI deemed university, renowned for providing cutting-edge education in technical fields. If one is expecting for better admissions after their graduation, the ITS may help them to fulfill it. Here, reading the complete article will relive you from each and every minute detail of the exam. The complete article supports you to get acquainted with information like eligibility criteria, registration details, how to fill ATIT Online Application Form and follow up of pre and post-exam events. The table will help all of the students to know important dates of the event and be prepared in advance. Take a look at date sheet to know what’s currently going on. The exam is the university entry level test. The admission test can be given by students in the online and offline mode as per their convenience. The ITSAT 2019 Slot Booking will help students change their confirmation for the online exam as per their availability to give the exam. While for the offline test, admit card will reveal all the details. As the test for admission into the technical school, qualifying exam grants allotment of admission to applicants in different branches of engineering. The exam can also be given by students who have appeared in the 12th class examination same year. Qualification: Students who have done complete 12 years of schooling can apply only. Marks: The willing contender should have passed 10+2 in Physics, Chemistry, and Mathematics with a minimum aggregate of 50% marks. The aggregate 50% marks are the eligibility criteria for admission in Hyderabad, Dehradun, Tripura, Jaipur, Raipur & Jharkhand. While for admission in Himachal Pradesh, it is necessary to have minimum 55% aggregate. Got to the website of ITS. From the home page click on the option of Admission and open the online registration portal. Complete your registration before the last date as the link will be inactive afterward. Fill the online form and process the fee through online payment option only. Once the fee is submitted successfully, it confirms the successful submission of ATIT Online Application Form. Though the ATIT exam is available in both offline and online methods, the ICFAI ATIT Exam Pattern will be same. Students should know that the Exam Dates will be same hence; they need to be geared up for the final performance by the month of April. Those who haven’t given the JEE might not be familiar with the difficulty of online examination. Thus the syllabus will help all to form the base for the competitive exam. For easy understanding students here can get the detailed ATIT 2019 Syllabus topic wise. The students can also find important books of the exam. The syllabus will also compensate most important topics. The admit card will be given to applicants from those selected cities where the offline examination is available to provide information on ATIT Exam Date. The ITSAT Admit Card has to be downloaded by the students who have chosen the conventional method of the exam. If online exam method has been chosen, students need to participate in the ATIT Slot Booking. While appearing in the exam, it is necessary for the students to be present with their hall ticket and photo ID proof. The Institute announces its results for both the online and offline examination at ITS official website only. Students will be able to check their updates in the month of May 2019. The qualifier of the exam will be called for the interview process. To know exact dates of ITSAT 2019 Result keep referring updates given here. The ATIT Admission Through ITSAT 2019 and decision of college will be provided to the students only after their performance in the interview process. The interview here will act as the counseling for college from different campuses. However, the interview shall be taken up in the month of June.